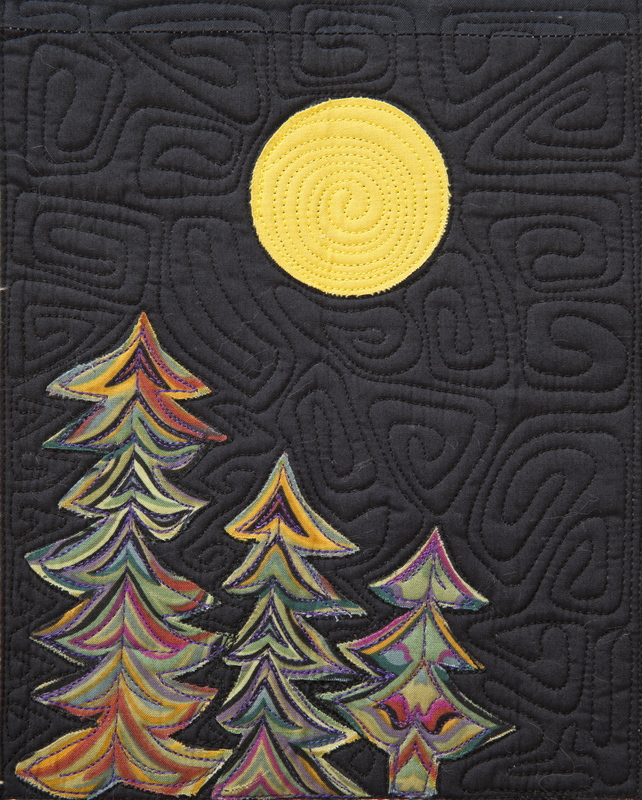 Yesterday, I taught Art Appliqué at the Quilt Zone. 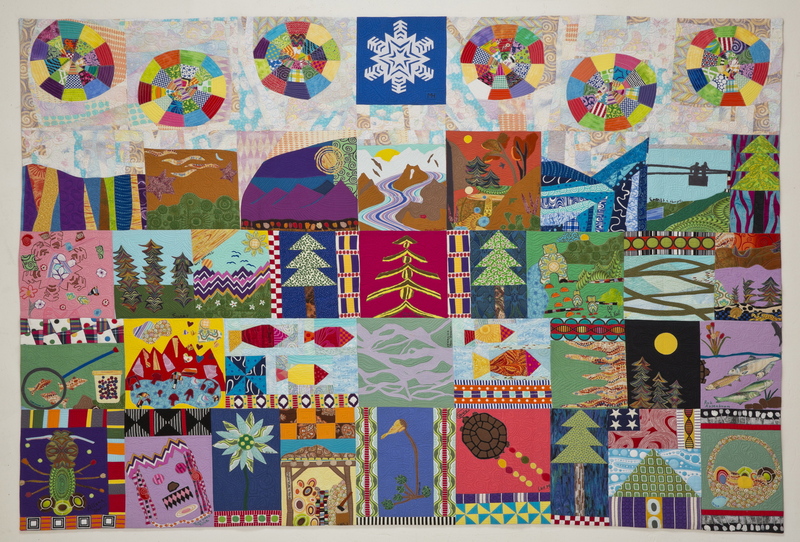 I’ve used the technique taught in this class to create many community quilts. Here is McCarthy Solstice made by the locals of McCarthy, Alaska. 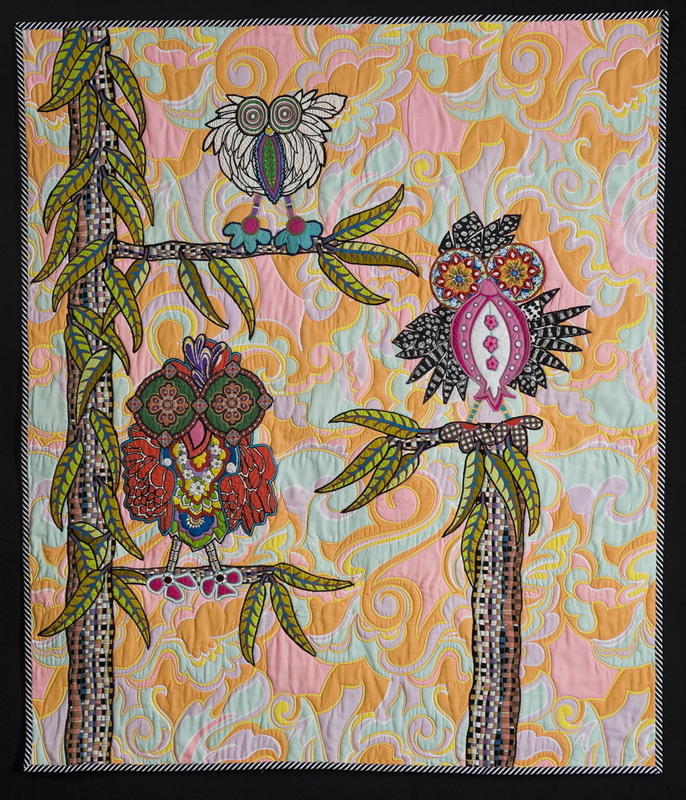 I have also helped many people build baby quilts like this one for my friend Tina’s daughter Eleena. 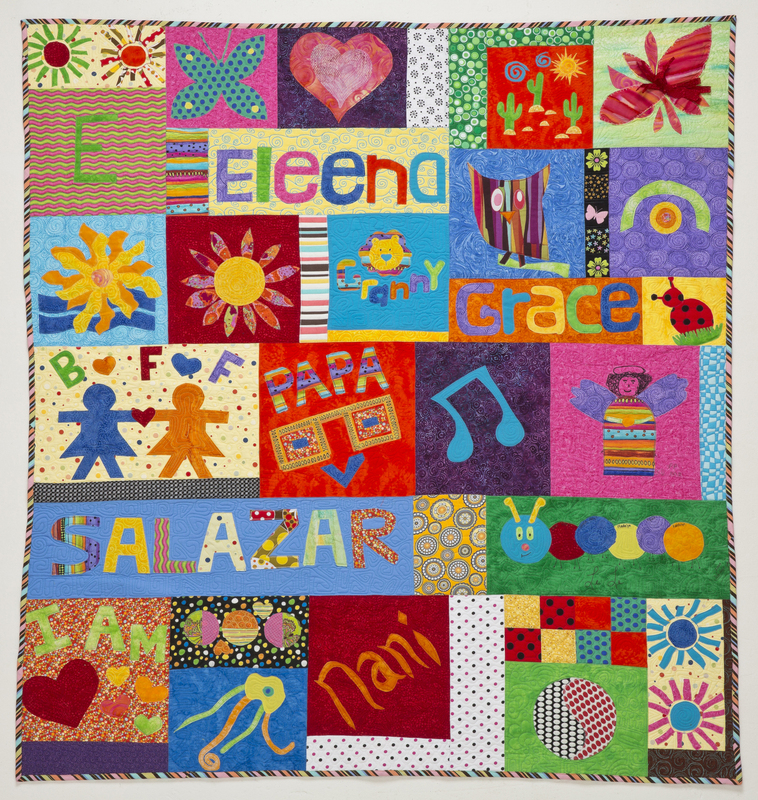 With both types of community quilts, it is rare that the participants actually know how to piece, appliqué, or quilt. They don’t know the rules of quilt-making which is usually a good thing. Of course there is always the renegade participant who glues his design to the ironing board or iron. That’s a little crazy, but I’ve gotten good at identifying those types before they can do too much damage. I recommend fabrics that have bold geometrics such as strips, dots, and plaids. Solid fabrics are also good. These fabrics are then cut into shapes. 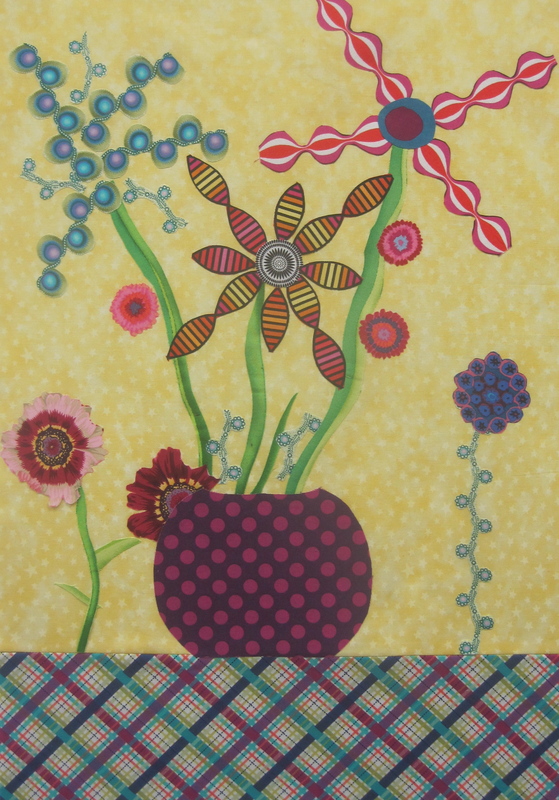 With the bold geometrics, I use the pattern in the fabric to make all sorts of things. 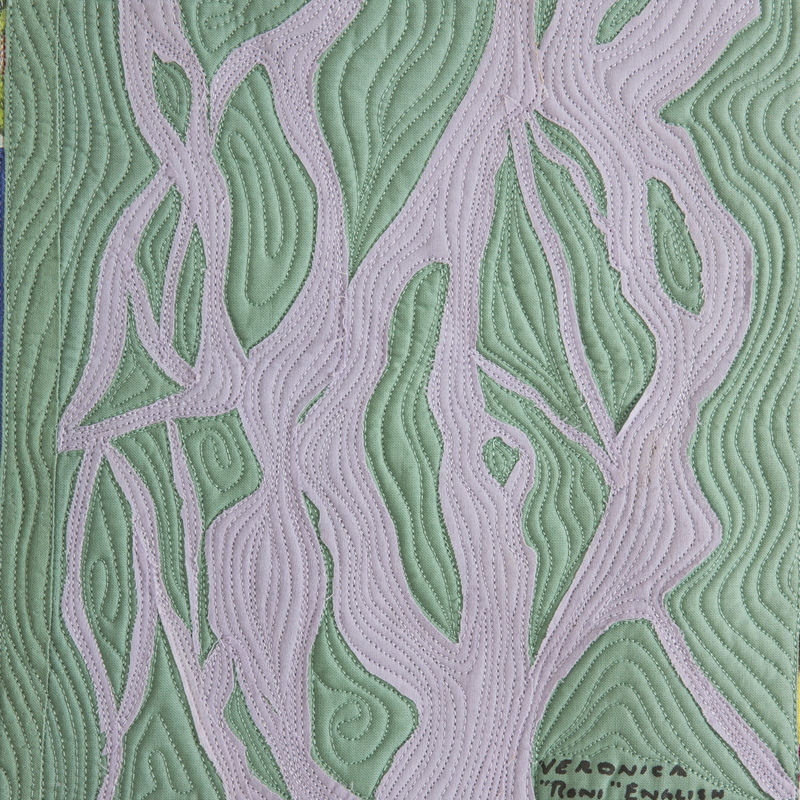 If you have studied the history of quilt-making, you will know that this is really just my take on Broderie perse. In Owsley’s Owls, I used this technique to make a bunch of funky birds. 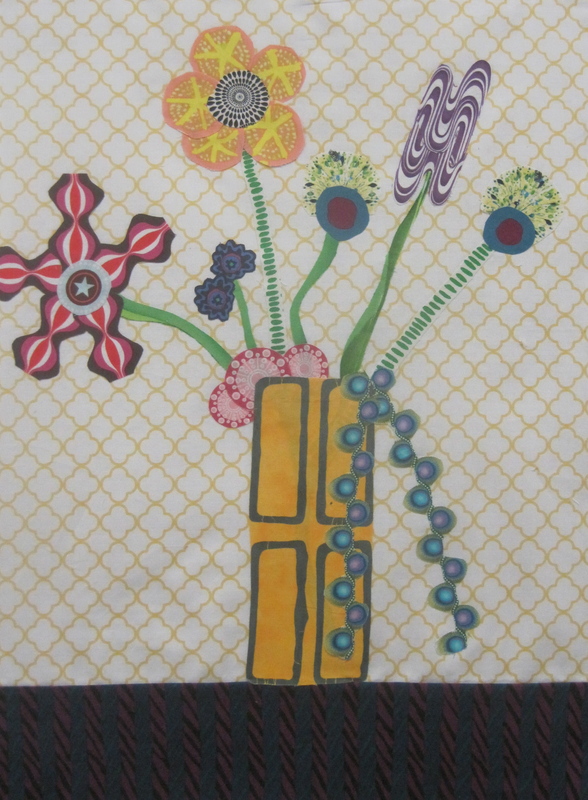 And here I have made a grouping of flowers in a vase. 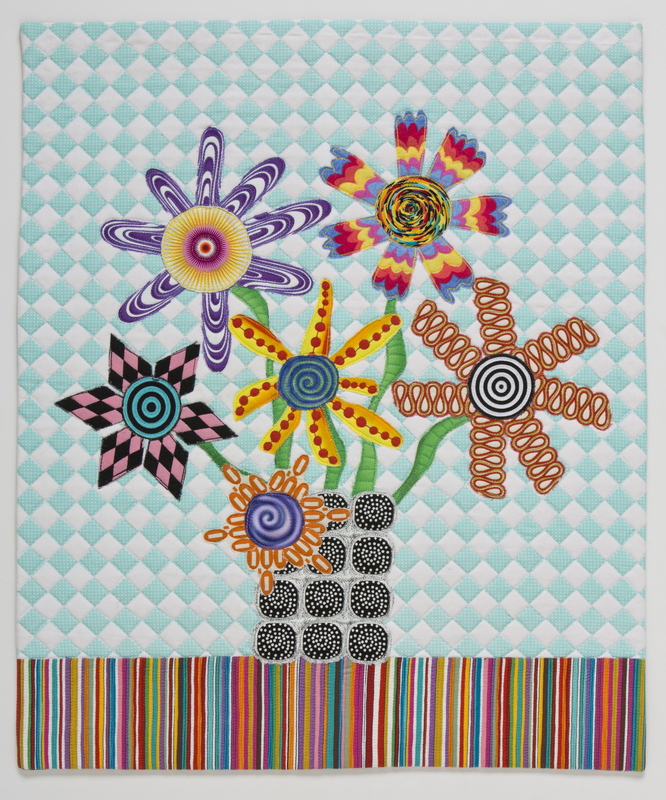 It is really fun to make flowers. The solid fabrics are cut up into shapes that also represent new things. 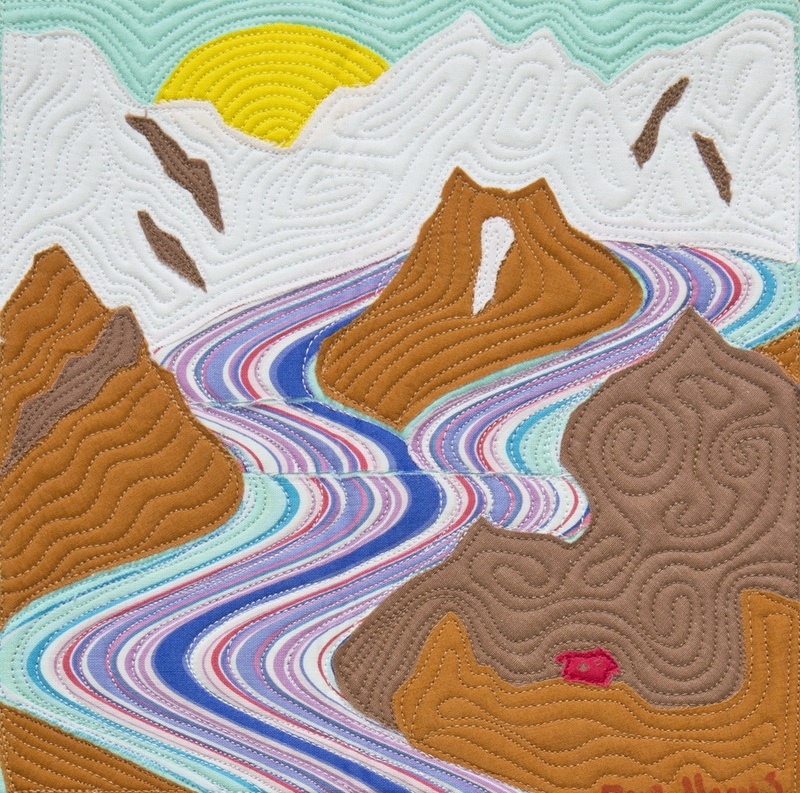 Here is a braided river and a mountain range. 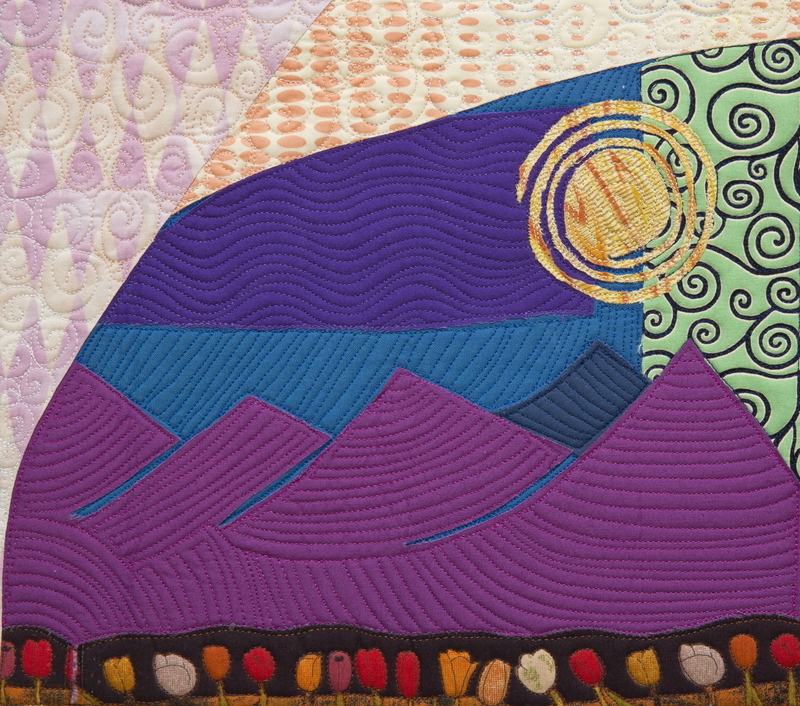 You can combine both the solid fabrics and the bold geometrics to create all kinds of images. 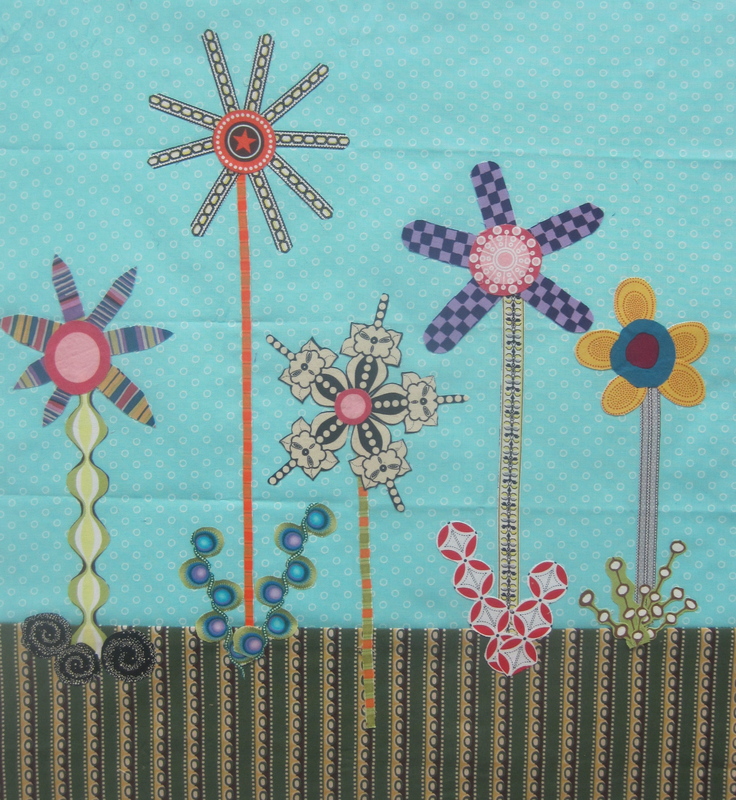 I have never taught this style of improvisational appliqué to traditional quilter-makers. I must say at first I was afraid the entire thing was going to go awry. There was a wee bit of tension in the classroom over getting things right, and it didn’t help that my supply list was on the vague side. In the end, creativity trumped tension and art was made. I was so happy to see everyone let loose. There was really an ah-ha moment when the students got it and dove deep into making their own flower gardens and bouquets. Having your students leave the class with beautiful original work is one of the most satisfy experiences a teacher can have. I’ll be writing more about this process and how to build a community quilt or your own flower bouquet in the next week or so. Stay tuned for more information. 30 Mar	This entry was published on March 30, 2014 at 10:51 AM. 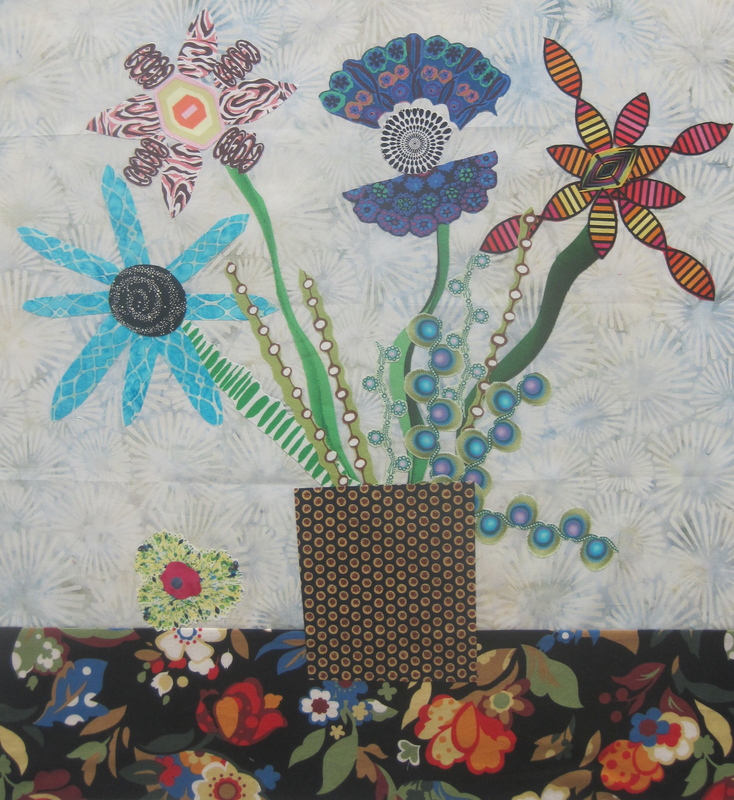 It’s filed under About Teaching, Quilt Stories, Uncategorized and tagged Art Applique, Improvisational Applique, Quilt Zone. Bookmark the permalink. Follow any comments here with the RSS feed for this post. LOVE LOVE LOVE those funky birds and flowers. 🙂 I bet they had fun working out the project!! Thank you Mary. Some day I hope to make some more birds and fish too!